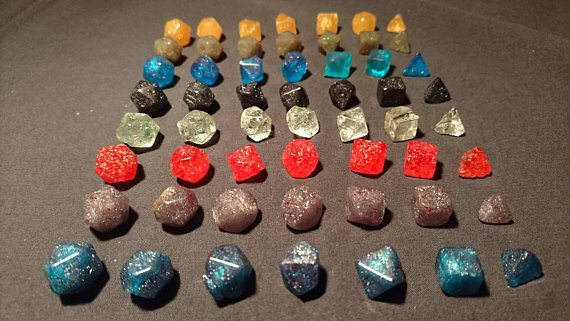 German pastry chef, gamer, cosplayer, and Twittizen, Sonja decided to make a batch of edible candy RPG/polyhedral dice. She posted pictures on Twitter and all the nerds came running to her yard. Realizing she might have a hungry market on her hands, Sonja has quickly opened up an Etsy store, the cleverly-named, Sugar and Dice. Batches of the dice are Isomalt sugar and are edible. They can either be "eaten as a hard candy bonbon or dissolved into a hot cup of tea or coffee." Sonja points out that they are not balanced and not perfect on all sides, so they can't really be reliably used in gaming. A set of 7 dice (1 each of d4, d6, d8, d10, d12, d100, and d20) will run you £18, shipped to the US (and take 1-2 weeks). Not exactly penny candy, but a cool novelty and a unique, fun gift for a gamer friend. I will definitely be getting some. A set of these will make a nice gaming night prize. There will not be fresh Sweethearts candies this Valentine’s Day.